Long a neglected green oasis at the far end of Northeast Philadelphia, Benjamin Rush State Park will finally receive some serious investment and turn around a place that people avoid into a major park in the City. According to a press release from the Governor's Office 3 miles of trails will be a included in the 2.7 million dollar project. 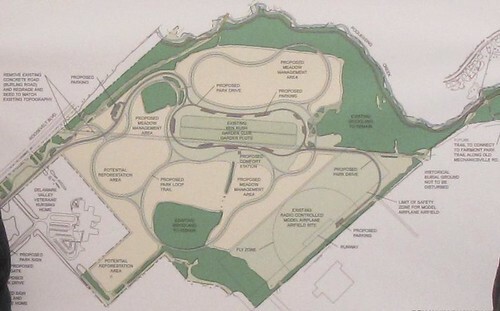 Construction may begin as early as the Summer of 2011. The lack of development of the park, which only houses a community garden and model airplane field has led to parcels of the park being ceded to other uses. The cut out white area in the southwest corner of the map shows 19 acres that were taken to develop a nursing home. Future plans include building a multi-use trail along the Poquessing Creek which will continue through the Parkwood neighborhood, behind Franklin Mills and down to an existing trail adjacent to Holy Family University.